Wild and beautiful spots around the state are looking for people to pitch in. Where can you lend a hand this Earth Day? Find out at the California State Parks web site. BUCKETS, SHOVELS, COMMITMENT: Ever arrived at a beach or a shore or a pond after a group of volunteers have swept through, determined to pick up every can and bag and random bit of plastic in sight? You can have the feeling that you're the first person ever to call upon the pond or shore, which is a magical and all-too-rare emotion to experience in these modern times. That isn't to be self-focused or selfish -- everybody should have that feeling when they go to nature. "Leave No Trace" is a prominent policy that lends love to this idea, an idea that we must travel with a light, light footstep. EARTH DAY, as well as California Coastal Clean-Up Day in the fall, is a powerful way to provide our fellow humans that "Leave No Trace"-style experience in a wild place. 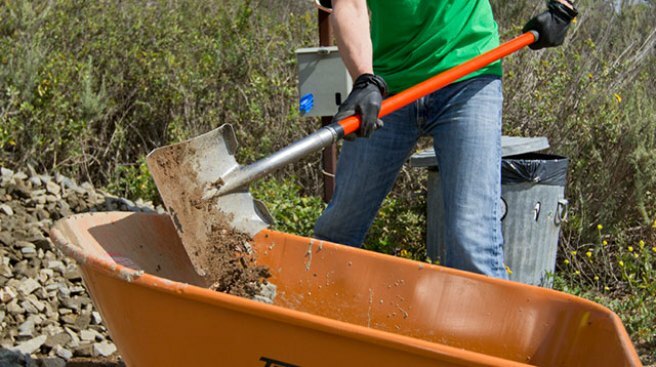 But, of course, volunteers join Earth Day projects not solely so the spot in question can be enjoyed by people, but that it is more itself, cleaned up, tended to, and cared for by many. The Earth Day initiatives through the California State Parks aren't solely about clean-up, though that will be part of the Saturday, April 18 happening at some locations. It's about small painting projects and the planting of native trees and removing invasive plants and much more. Much. LOCATIONS ACROSS CALIFORNIA... are looking for some elbow grease and enthusiasm on the third Saturday in April, so head for Hearst San Simeon State Park, where you may help prepare a shore whaling site or San Onofre State Beach to plant native plants (the sanding and painting of beach benches is on the docket as well). A few dozen state parks have sign-up needs, and a number of volunteers required, so make sure you pick the place you're going and let them know ahead of time to expect you. And, of course, you don't need to wait for April 18. California State Parks offers several ways to pitch in, both by restoring the benches and fences and human-helpful objects of our parks and by cleaning them up, too.